William Marsh Rice University, commonly referred to as Rice University or Rice, is a private research university located on a 295-acre (1.19 km2) campus in Houston, Texas, United States. The university is situated near the Houston Museum District and is adjacent to the Texas Medical Center. Rice is generally considered the top university and the most selective institute of higher education in the state of Texas. Opened in 1912 after the murder of its namesake William Marsh Rice, Rice is now a research university with an undergraduate focus. Its emphasis on education is demonstrated by a small student body and 6:1 student-faculty ratio. The university has a very high level of research activity for its size, with $115.3 million in sponsored research funding in 2011. Rice is noted for its applied science programs in the fields of artificial heart research, structural chemical analysis, signal processing, space science, and nanotechnology. It was ranked first in the world in materials science research by the Times Higher Education (THE) in 2010. Rice is a member of the Association of American Universities. The university is organized into eleven residential colleges and eight schools of academic study, including the Wiess School of Natural Sciences, the George R. Brown School of Engineering, the School of Social Sciences, and the School of Humanities. Graduate programs are offered through the Jesse H. Jones Graduate School of Business, School of Architecture, Shepherd School of Music, and Susanne M. Glasscock School of Continuing Studies. Rice students are bound by the strict Honor Code, which is enforced by a student-run Honor Council. Rice competes in 14 NCAA Division I varsity sports and is a part of Conference USA, often competing with its cross-town rival the University of Houston. Intramural and club sports are offered in a wide variety of activities such as jiu jitsu, water polo, and crew. What are the academic rankings for Rice University? 1. number 20 for Academics. 2. number 4 for ROI (Return on Investment). 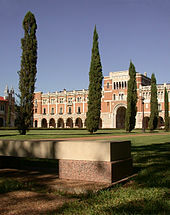 What universities are similar to Rice University?